Defeat Villains (Juggernaut, Mystique, Sabretooth) to fight Sauron. Finish Quests (T-Rex, Megalodon) to light extra ball. Defeat all Villains twice, complete both Quests, and beat Sauron to qualify Wizard Mode! Villain fights are qualified by spelling D-E-A-D, then started at the scoop. Bring Teammates into the battle to TEAM-UP for extra powers. Defeat villains by shooting the flashing shots before your health-bar runs out. Pop bumpers, spinners, & top lanes always do a small amount of damage. Team-ups add more flashing shots to damage the villain. TEAM-UP with Teammates by shooting their respective shots BEFORE you start a fight! Dazzler (Left orbit): Double your Health! Colossus (U-Turn): Double Scoring during battle! Wolverine (Center spinner): Double Damage! Villains! Sabretooth is the easiest to defeat, but scores the lowest. Juggernaut is the hardest to beat, but scores the highest! Mystique is in the middle. Earn extra style points (and actual “Finishing Bonus” points) by shooting the scoop hurry-up after the villain reaches zero health. You will still win the fight if you run out of time. Your health-bar functions as the timer for each battle. Earn more “Finishing Bonus” points the more health you retain. Five Point Palm Exploding Heart Technique– fight Sabretooth with Wolverine and Dazzler as Teammates. A skillful shot to the left orbit will deplete his ENTIRE health bar, earning double damage from orbit, spinners, lanes, AND pops. Bring Colossus with you for even more points! Quests! – Who’s hungry? 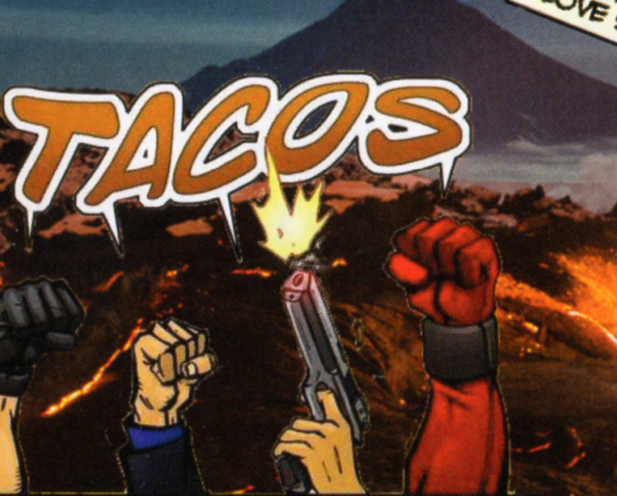 Quests are qualified by collecting chimichangas, then started at the scoop. To collect chimichangas, first shoot the right orbit until you earn a chimichanga “Punch Card.” Then fill out your card by shooting the various lit orange shots. A full card (default = 4 punches) qualifies a quest! 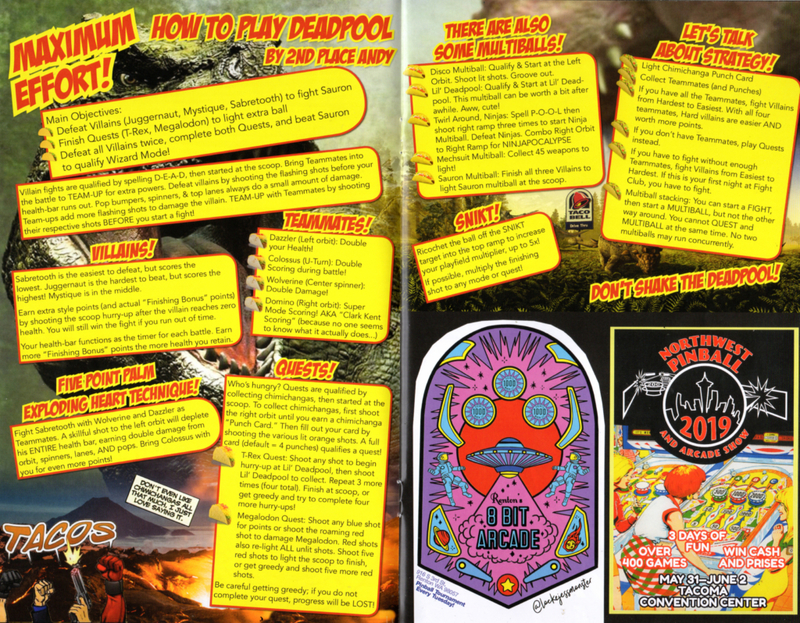 T-Rex Quest: Shoot any shot to begin hurry-up at Lil’ Deadpool, then shoot Lil’ Deadpool to collect. Repeat 3 more times (four total). Finish at scoop, or get greedy and try to complete four more hurry-ups! Megalodon Quest: Shoot any blue shot for points or shoot the roaming red shot to damage Megalodon. Red shots also re-light ALL unlit shots. Shoot five red shots to light the scoop to finish, or get greedy and shoot five more red shots. Be careful getting greedy; if you do not complete your quest, progress will be LOST! There are also some Multiballs! Disco Multiball- Qualify & Start at the Left Orbit. Shoot lit shots. Groove out. Lil’ Deadpool- Qualify & Start at Lil’ Deadpool. This multiball can be worth a bit after awhile. Aww, cute! Mechsuit Multiball- Coming Soon! Keep stockpiling your weapons. Sauron Multiball- Finish all three Villains to light Sauron multiball at the scoop. If you have all the Teammates, fight Villains from Hardest to Easiest. With all four teammates, Hard villains are easier AND worth more points. If you don’t have Teammates, play Quests instead. If you have to fight without enough Teammates, fight Villains from Easiest to Hardest. If this is your first night at Fight Club, you have to fight. Multiball stacking. You can start a FIGHT, then start a MULTIBALL, but not the other way around. You cannot QUEST and MULTIBALL at the same time. No two multiballs may run concurrently. Ricochet the ball off the SNIKT target into the top ramp to increase your playfield multiplier, up to 5x! If possible, multiply the finishing shot to any mode or quest!